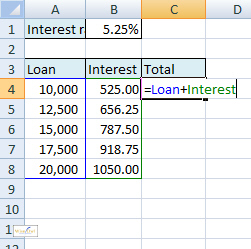 Did you know that you don't have to use cell references in calculations in Microsoft Excel? You can use range names to create sensible, plain English names to refer to your cells and use those in your formulae instead. Read this blog to find out how. When you start using Excel you will most likely have been taught to refer to cells using their cell references, for example A1 or D2:D10 etc. Did you know that there's a way to give a name to a range of cells and then to use this name in your formulae? Read on to find out how! One of the easiest ways to give a name to a range of cells is to simply type a name into the Name Box. You can see the Name Box in the top left hand corner of your screen, as shown in the diagram below. By default, the Name Box shows the cell reference of the active cell. Select the cell or cells you want to name. Click into the Name Box. Type in the name you want to use (see the hint below). Click into the Name Box... ...and type in a name for the cell. You can't include spaces in your range names! There are many other disallowed punctuation characters, but you can still use the underscore ( _ ), the backslash ( \ ), the full stop ( . ) and the question mark (? ). 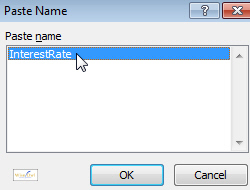 You can include numbers in a range name as long as the name doesn't start with a number. 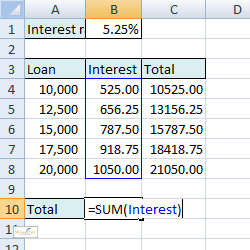 Once you have created a name to refer to a cell, you can use the name in place of cell references in a calculation. The diagrams below show the same formula, one uses absolute cell references, the other uses a range name. This works, but looks awkward. This formula is much clearer. 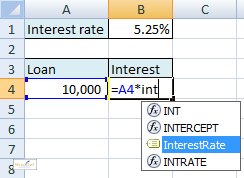 In Excel 2007 and 2010 your range names will appear in a drop down list as you type in your formula. When you have the range name highlighted in the list, press Tab on the keyboard or double-click on it with the mouse to insert the name into your formula. 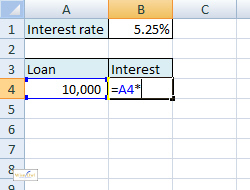 In any version of Excel you can press F3 on the keyboard while typing a formula to insert a range name. Press F3 at this point... ...to see a list of range names that you can insert into the formula. If you have sensible row and column headings in a spreadsheet you can tell Excel to use these headings to create range names. 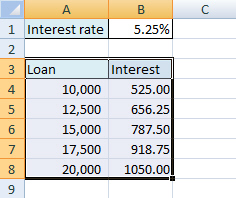 In this example we can create two range names at the same time: one called Loan to refer to cells A4:A8, and one called Interest to refer to cells B4:B8. To do this we need to select cells A3:B8 first. 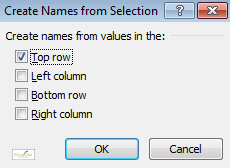 This will open a dialog box asking for the location of the row or column headings you want to use to create your range name(s). You can check that all of the range names have been created by clicking on the drop down arrow to the right of the Name Box at the top left of the screen. Click the drop arrow next to the Name Box to see a full list of range names that you have created. We can now use the range names in more calculations. You can use range names in simple formulae like this... ...and in functions like this. In any version of Excel, press CTRL + F3 on the keyboard. You can now change any of your range names using the sensibly labelled buttons on the dialog box. 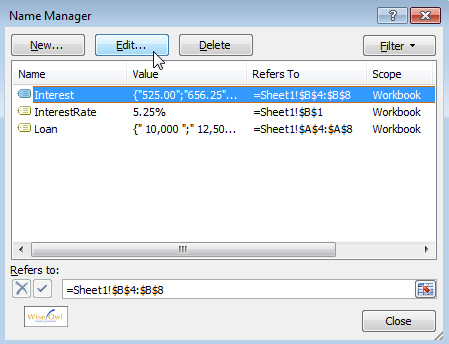 This is the Name Manager in Excel 2007. 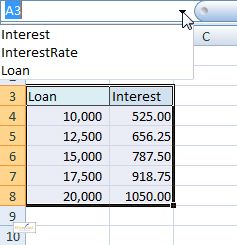 The dialog box is slightly different in Excel 2003 but you can still add, edit or delete range names using it. You can use range names in any formula you create in place of the cell references that you would normally use. They make your calculations much easier to read and avoid the need to consider whether you need to use relative or absolute cell references. They're well worth the effort of learning how to use them.